Purple on my fingers, purple on my toes.. pretty much purple everywhere in my life right now! There's something really unique about this colour that has made me gravitate towards it this summer, maybe the pink undertones that give it a pop of colour. The thin (non gloopish..) formula of this polish goes on like a dream and dries really quick - just what you need on a summer holiday, no time to wait for tacky nails to dry! I like to use a topcoat with this one so it looks nice and glossy because otherwise it can look a little duller than the bottle suggests. All in all, it's one of my all time faves from Essie and I would definitely recommend picking it up! I love this colour! Would look great for every season! 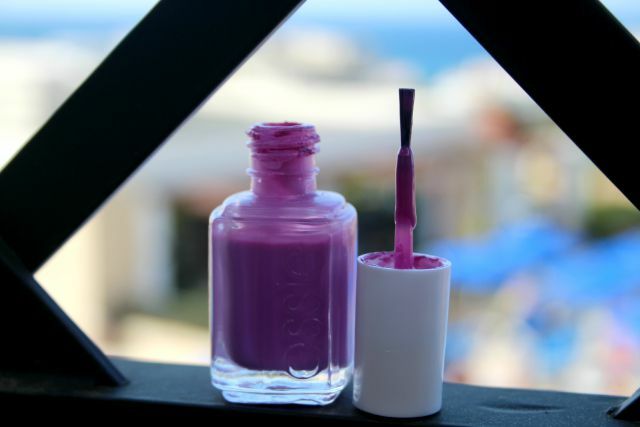 Love this shade - so perfect for summer too. Nice choice : ).